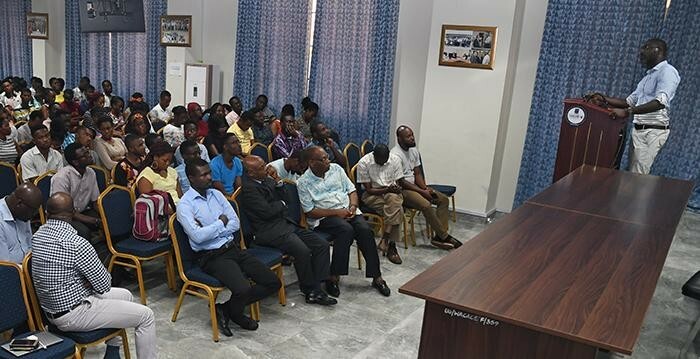 Lawrence Adutwum during a machine learning seminar at the West African Centre for Cell Biology of Infectious Pathogens in Accra, Ghana. Lawrence Adutwum’s commute between campuses is one quarter of the way around the world. The Earth’s circumference is just over 40,000 kilometers, and his lab at the University of Alberta in Edmonton is just under 11,000 kilometers from his classrooms at the School of Pharmacy, University of Ghana in Accra. He’s able to contribute to research and teaching in both institutions thanks to the nature of his expertise: a pharmacist and chemist by training, Lawrence is one of Future Energy Systems’ machine learning pioneers. 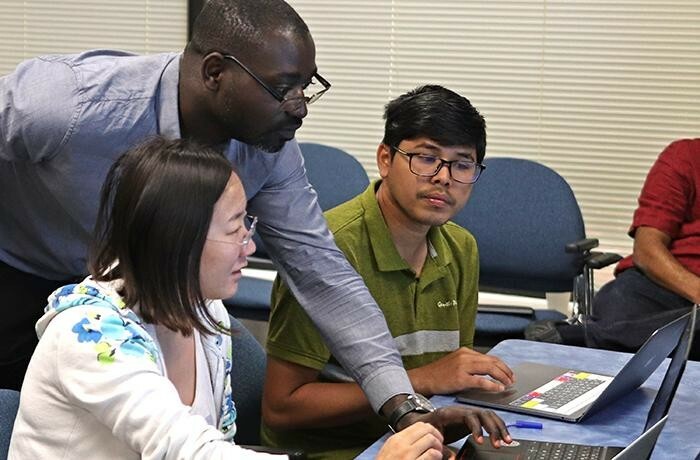 This summer he helped offer machine learning workshops to researchers from across the University of Alberta, and this autumn he’s doing the same in his West African home. In the process he’s proving that machine learning is truly a research tool without borders, and that expertise developed from energy research can positively impact a completely different field like health. Lawrence was one of the corresponding authors on a recent paper published in ACSNano detailing how he and his teammates in Dr. Arthur Mar’s research group helped Dr. Jillian Buriak’s team improve the efficiency of their groundbreaking organic solar cells by 30 percent. The speed of this advancement was significant: Buriak’s team had spent years using traditional Edisonian experimental techniques to refine their technology, but Lawrence’s machine learning analysis of their data meant the next discovery could be made after only a few dozen experiments, instead of thousands. Armed with this experience, Lawrence joined Mar, teammate Anton Oliynyk, and the Chemical Engineering research team led by Dr. Arvind Rajendran and Dr. Vinay Prasad in offering introductory machine learning workshops for researchers from across the Future Energy Systems research program. Over two days he helped microbiologists, physicists, systems engineers and economists run analyses of sample datasets, giving them direct, hands-on experience with software that has the potential reshape their research. Lawrence didn’t arrive at the University of Alberta with energy in mind. 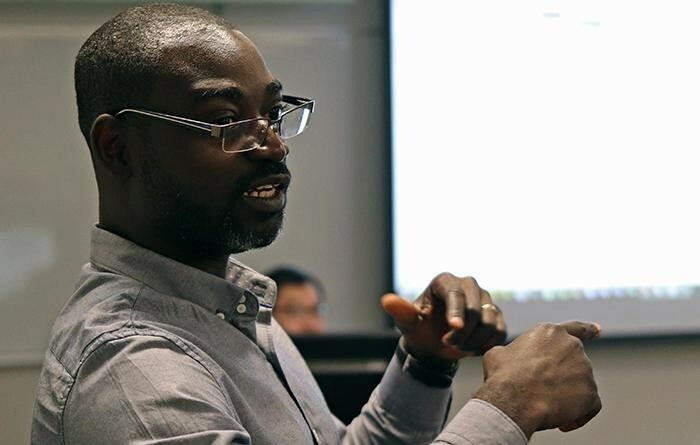 After serving as Head of the University of Ghana’s Department of Pharmaceutical Chemistry, he came to Edmonton to build his expertise in gas chromatography with the group of Dr. James Harynuk. There he was introduced to the tools of machine learning, which ultimately led him to Mar’s materials chemistry team and the Future Energy Systems solar theme. In Ghana he believes the tool’s most immediate uses could be in the areas of healthcare, drug discovery and quality control, helping ensure that relatively limited resources are directed towards research and procedures most likely to make a difference for patients in West Africa and beyond. With that in mind, he has delivered introductory machine learning seminars at the University of Ghana’s School of Pharmacy, and the Department of Biochemistry under the West African Centre for Cell Biology of Infectious Pathogens. The most recent event was attended by more than 200 people. “Whether it helps us track patient outcomes and adopt new treatment procedures, or allows us to extract hidden gems in experimental data, machine learning has the potential to make our research program more effective,” he asserts. Machine learning software can be run on an average laptop, so with a secure internet connection in Accra, Lawrence has been able to continue his Future Energy Systems research with Mar’s solar group. When he finishes teaching each semester, he also spends a full day in the air flying 11,000 kilometers (or more, depending on connections) to return Edmonton. “Working remotely enables me to continue to contribute while I am at home, but even in machine learning you cannot replace the value of working side by side with your colleagues,” he explains. He values that first-hand experience so much that he pays for the airfares out of his own pocket. His good fortune benefits his colleagues on both continents. The University of Alberta and the University of Ghana are both members of the Worldwide Universities Network, and have a long-standing partnership in the field of nursing. Lawrence’s efforts represent another cutting-edge personal connection between the two institutions. He hopes that connection –– along with the efforts of other experts at the University of Alberta and beyond –– will eventually make machine learning so common that his expertise becomes unremarkable. To learn more about how Lawrence’s research contributed to the 30 percent increase in solar cell efficiency, click here. To learn more about the machine Dr. Arthur Mar’s machine learning group, of which Lawrence is part, click here. For more stories about Future Energy Systems students and post-doctoral fellows, click here. To subscribe for more updates, click here.